04:10:00 Make 4 servings, 1/2 cup (125 mL) each. Make 4 servings, 1/2 cup (125 mL) each. Looking for a cool and creamy chocolate dessert that fits into a healthy lifestyle? 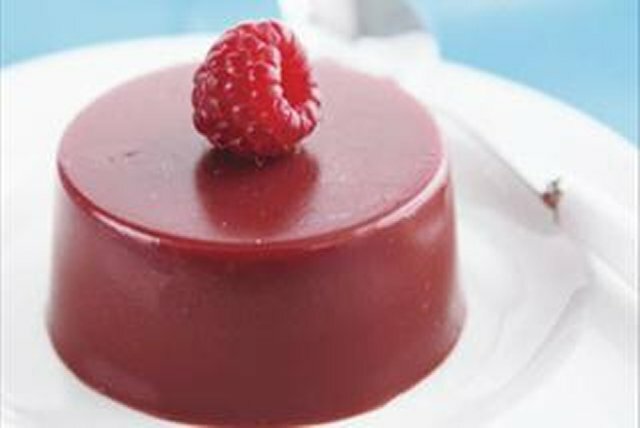 Sugar-free JELL-O, light whipped topping and fresh berries help make this chocolate dessert a Healthy Living recipe. Add boiling water to dry jelly powder. Stir 2 min. or until completely dissolved; set aside. Place chocolate, marshmallows and whipped topping in medium microwaveable bowl. Microwave on HIGH 2 min. or until marshamallows are completely melted and mixture is well blended when stirred. Gradually add jelly, beating with wire whisk after each addition until well blended. Pour into four individual dessert dishes or champagne flutes. Refrigerate 4 hours or until firm. Top with raspberries just before serving. Store leftovers in refrigerator. Prepare as directed, using Jell-O No Sugar Added Lemon Jelly Powder and Baker's White Chocolate. Melt additional Baker's Bittersweet Chocolate; drizzle over chilled flan. Or dust raspberries with icing sugar before using to garnish flan. If using individual dessert dishes, use a small metal spatula or pointed knife, dipped in warm water, to loosen top edge of each flan. Dip bottom of dish in warm, not hot, water just to rim, for about 15 sec. Lift from water, hold upright and shake gently to loosen flan. This dessert can be part of a healthy eating plan. Serving Size Make 4 servings, 1/2 cup (125 mL) each.